Solstic Twenty-Four offers 24 hours' worth of primary nutrition in a convenient, single-serving drink packet. It features vitamin D3 for immune, mood and bone support; vitamin K to help with calcium absorption and cardiovascular support; and B vitamins for energy and stamina. 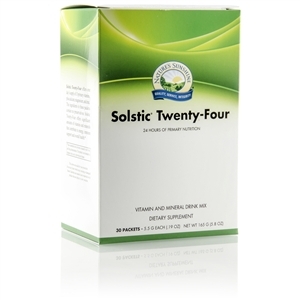 Solstic Twenty-Four also contains many other vitamins and minerals. Empty the contents of one Solstic Twenty-Four packet into 14-16 oz. of cold water, shake and enjoy. Take one packet daily.